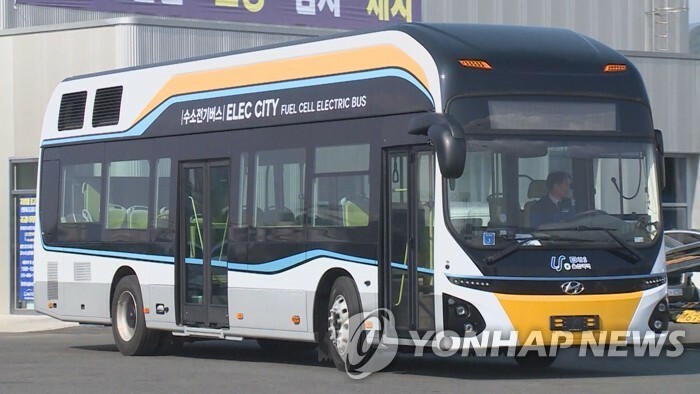 (SEOUL=Yonhap News) South Korea's industry ministry said Thursday it will invest 9.5 billion won (US$8.4 million) over the next three years to establish hydrogen charging stations that use biogas. The Ministry of Trade, Industry, and Energy said the project comes in line with the government's vision of building a society that uses hydrogen as the main source of energy for power generation, vehicles and other daily uses. The project will center on developing technologies that can get hydrogen from unused biogas obtained from organic materials, and build charging stations to utilize the resource to power environment-friendly hydrogen electric fuel cell buses. The ministry plans to request provincial governments to lend support by supplying biogas. The project is significant as the country can only utilize biogas currently not being used, and that it could help promote hydrogen-related technologies, the ministry said. Around 80 percent of biogas currently produced annually in South Korea is being used, while 20 percent is discarded. The amount being dumped translates into 100 tons of hydrogen, which is enough to charge 4,000 hydrogen-powered buses. The ministry plans to select organizations to carry out the project, through an official announcement, starting Friday.